Jane Barry is an internationally renown human rights activist and author. She has lived and worked in countries as diverse as Russia, Bosnia, Liberia, Rwanda, Cote d'Ivoire, Kosovo, and South Africa. 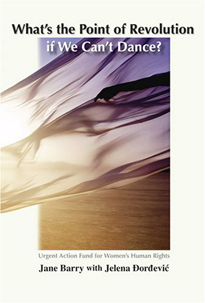 Barry's books and articles, among them A Bridge Too Far: Aid Agencies and the Military in Humanitarian Response (2002), Rising Up In Response (2005), and What's the Point of the Revolution if We Can't Dance (2007) have been translated into many languages. Since 2008 Barry has worked as a principal at the Seattle office of the consulting firm Linksbridge. For more information on this author go to linksbridge.com or https://en.wikipedia.org/wiki/Jane_F._Barry.